A circuit investigation of dual-band surface acoustic wave (SAW) filters of the ladder type is proposed. The designed filter exhibits a broader bandwidth and a sharper cut-off frequency than the conventional filter composed of the ladder and double-mode SAW (DMS) types. The SAW filters have been widely applied to the antenna duplexer given the progress in mobile communication technology. Furthermore, the SAW filters can be constructed into a wireless sensor system in combination with a SAW sensor. We demonstrate how simulations of ladder-type SAW filters based on the 48°YX-LiTaO3 are used to achieve a convenient design of the SAW band-pass filter for a high-power and wireless sensor system. These filters demonstrate the lowest insertion loss, the largest bandwidth, the optimal power durability, and a third-order intercept point compared with the interdigital transducer (IDT) and DMS. A simulation of a SAW resonator using the advanced design system (ADS) is performed with the lumped elements. The first passband that is applied to the Tx duplexer is in the range of 823–855 MHz, and the second passband applied to the Rx duplexer is from 867 to 898 MHz. 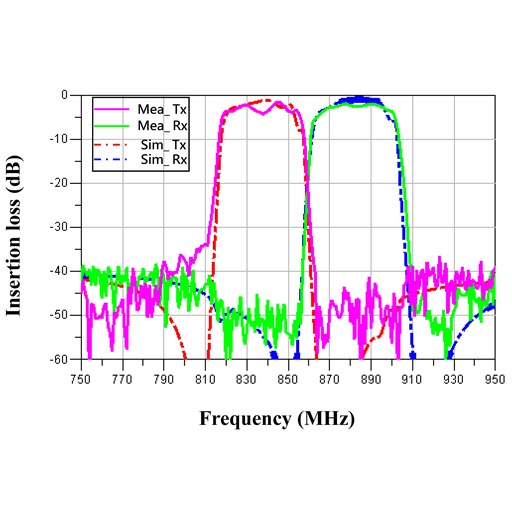 The frequency characteristics of the ladder-type duplexer possess minimum insertion losses of 1.14 dB in the first passband and 0.54 dB in the second passband, which are similar to those of the DMS duplexer. The isolation performance between Tx and Rx is 42.22 dB at 823–898 MHz, which is less than that of the DMS duplexer. The design of the appropriate SAW band pass filter will be simplified through a precise simulation. Furthermore, the dual-band structure with a ladder-type SAW can be expected to endure higher power and have a better isolation performance than conventional DMS structures. Chien-Yu Li, Hua-Jian Hsu, Lih-Shan Chen, and Mau-Phon Houng, Investigation of Characteristics of Dual-band Ladder-type Surface Acoustic Wave for High-power Durability Duplexer, Sens. Mater., Vol. 31, No. 2, 2019, p. 261-268.